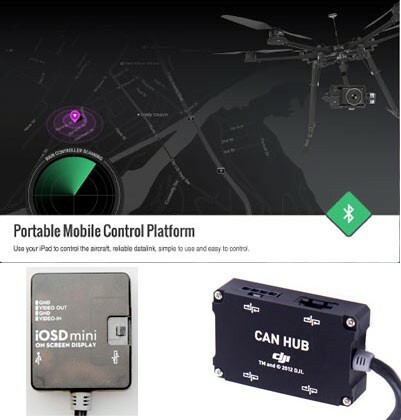 The DJI iOSD Mini, iPad Ground Station & Canhub package delivers the Naza M and Naza V2 user an On Screen Display and 16 way points when used with an iPad, this is a long awaited addition to the DJI A2 M, DJI Wookong M & Naza M V2 which is great for the FPV flyer who needs accurate flight data information in the shortest possible time from the DJI iOSD Mini, this will give you the best FPV flight experience. When you want to take your flights to the next level with way point flights the 2.4 Ghz Bluetooth link will connect with the Naza and allow you to set a flight plan. The DJI iOSD Mini will work with the Naza M V1 with the addition of the Naza M V2 PMU & DJI Naza GPS if not already installed. 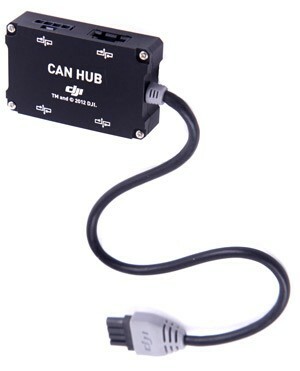 The DJI Can Hub provides a very quick and easy plug and play solution for adding additional Can Ports on the Naza M V2 or the DJI A2 M / DJI Wookong M flight controller systems, when you have run out of Can Ports for your DJI upgrades, this added Can Hub is the solution you need. The DJI Can Hub will allow you to add upgrades like the DJI BTU (Bluetooth unit), Zenmuse H3-3D, Mini iOSD, iOSD Mark II, Naza V2 LED. The DJI ipad Ground Control Station (GS) App is for the iPad 3 / 4 and Mini offers full support for all of DJI multi-rotor flight controllers, the DJI iOS can access the parameters to allow the user to change them with ease or set waypoints wirelessly from an iPad. These additional features from DJI iPad Ground Station will give both the hobby and aerial photography professionals another tool to conduct fun or professional flights with a real time mapping and flight data clearly displayed to monitor the multi rotors progression and key flight information. The DJI iPad Ground Station comes with the click & go function, 50 waypoints for the WooKong M and 16 waypoints for the Naza M, these are enabled after a firmare upgrade to the flight controller, you are now just a few taps away with the iOS Ground Station from ways point flights! 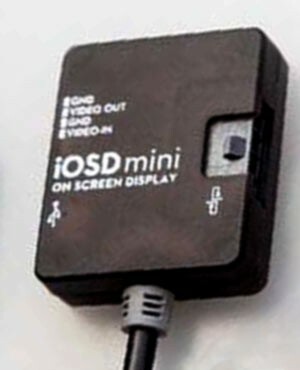 The iPad Ground Station Includes the 2.4 GHz Bluethooth Datalink and Way point licence.